Overview about ISO File - ISO files are disk image files that allow you to create an image of a CD or DVD as a file and then access the file on your hard drive without having to insert your CD or DVD into the disk drive each time you want to use it. An ISO image includes all the data of files contained on the archived CD/DVD, or any other disc format. They are stored in an uncompressed format. In addition to data of the files it also contains all the file system metadata, including boot code, structures, and attributes. ISO images do not support multi-track, thus they cannot be used for audio CDs, VCD, and hybrid audio CDs, which are usually ripped as audio files. However, for disks that contain a single track of data followed by tracks of audio, such as video game disks, the first track can be ripped as an ISO, and the rest as audio files. How to Burn ISO to DVD with ISO Burners? If the file is an ISO you can burn it on cd or dvd. For cd burn VCD or SVCD in order to play on a regular DVD player if is an ISO for DVD the size is bigger starting with over 1 Gb and after burning is already done so you can play it on your dvd player to watch it on tv. If is just an avi file that’s a different story. So find on your burning software burn image.Iso file can not be converted, to watch it have to be burnt, only avi Xvid MPEG may be converted in a different format and standard, and so on. From ISO you can make just another type of image file or open it, extract the video file and convert it. Here are the best software to convert ISO to DVD that you can play your movies in home DVD player easily! Free DVD ISO Burner can burn ISO image to DVD/CD disc, such as CD-R, CD-RW, DVD-R, DVD+R, DVD-RW, DVD+RW. With Free DVD ISO Burner, you can choose proper write speed to get the maximum burning speed and it will verify written data after burning process. 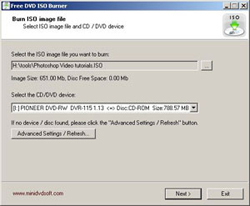 ISO Image Burner is a useful tool that can help you to burn your ISO image files to CD/DVD Disc, support CD-R, DVD-R, DVD+R, CD-RW, DVD-RW, DL DVD+RW, HD DVD and Blu-ray Disc. It has ability to make bootable CD/DVD image file, process the boot information for CD/DVD image file, and have many other burning options, include test write, finalize disc and more. This handy utility is easy to use very much, at the best, ISO Image Burner is 100% free, be free for both personal and commercial use, install or uninstall is very simple, burin your ISO image on the fly. Program support standard ISO9660 (default) and Joliet File System. This program can also be used to erase CD-RW media. You may be want to burn your ISO movies to DVD, so that you can share your movies in home DVD player with your frends. Now I recommend a very excellent ISO to DVD burner - Active@ ISO Burner. This utilities program is a freeware application that will allow you to burn an ISO image file to CD-R, DVD-R, DVD+R, CD-RW, DVD-RW and DVD+RW. Software accepts command line parameters to automate ISO images burning process. With it you can burn your ISO to DVD. ISO Burner is an easy-to-use and powerful ISO Burner to burn MP3, DATA, ISO, AUDIOS, VIDEOS, and IMAGES to high-quality CDs or DVDs. You can create and burn ISO image file. It can support Long File Name File System, It can supports CD-R, CD-RW, DVD-R, DVD-RW, DVD-RAM, DVD+R, DVD+RW and DVD+R DL. You can Write on Rewritable CDs/DVDs, You can make backup system, software and data easily. You can free life time updates. Smart and professional, Xilisoft ISO Burner makes it easy to burn ISO to CD, burn ISO to DVD, including data ISO, movie ISO, and bootable ISO image files to CD-R, CD-RW, DVD-R, DVD+R, DVD-RW, DVD+RW, DVD+R DL. The DVD ISO burner can also burn image files of all other formats, such as BIN/CUE, IMG, MDF, NRG, CDI, B5i, B6i, and DMG. Wondershare ISO Burner performs as a powerful ISO DVD converter which helps you easily rip/convert your DVD disc/folder to ISO image files with super fast speed. It also enable you to burn ISO image files to DVD discs or burn ISO image files to CD Discs. Wondershare ISO Burner also features as a wonderful ISO DVD burner. With this amazing burning tool you can perfectly burn ISO image files to DVD disc such as DVD-R, DVD+R, DVD-RW, DVD+RW, DVD+R DL and CD-RW,CD+R,CD-R. etc. In addition, Wondershare ISO Image Burner empowers you to have a good and full control of your ISO files by sorting, customizing file information etc in an easy way.